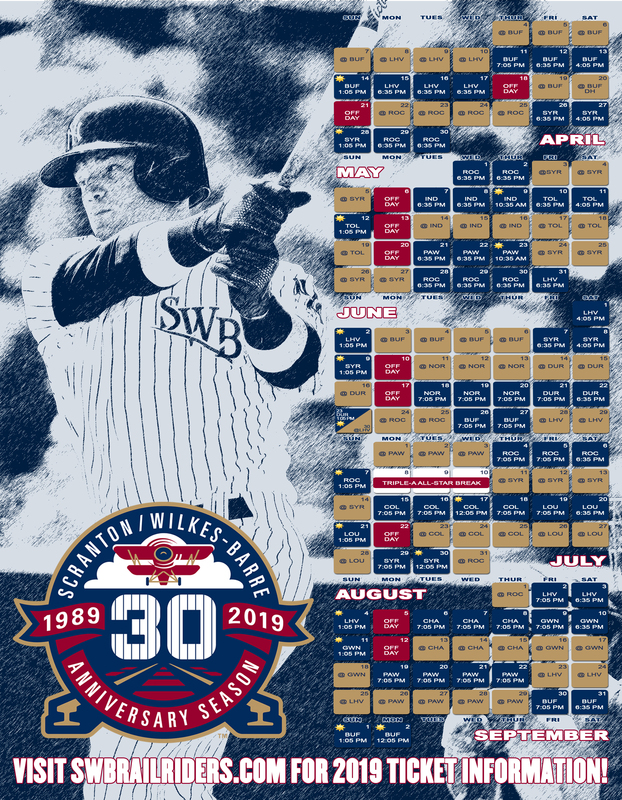 MOOSIC, PA (August 23, 2018) - The Scranton/Wilkes-Barre RailRiders are pleased to announce their 2019 schedule with plans to honor 30 seasons of baseball in Northeast Pennsylvania. The 2019 season will open on April 4 at Buffalo with the home opener at PNC Field slated for Thursday, April 11, against the Bisons. In 1989, the Maine Guides moved to Lackawanna County Stadium and debuted as the Scranton/Wilkes-Barre Red Barons. 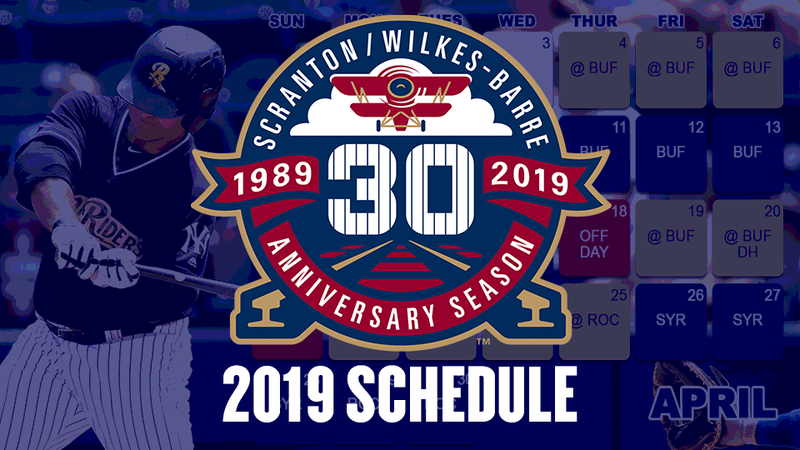 The RailRiders plan to pay homage to the Red Barons, the Scranton/Wilkes-Barre Yankees and their own brief identity through season-long tributes and promotions. "With such a vast history of players who have come through Northeast Pennsylvania, we want to make sure that the RailRiders correctly honor the legacy of professional baseball over the last 30 years, Team President and General Manager Josh Olerud said. "We have some really fun plans in place to make such that fans of both the Yankees and Phillies eras are represented, with more discussions to follow the current regular season." One such element will be a nine character, season-long bobblehead giveaway series. During the off-season, the RailRiders will run voting to determine an all-time SWB team, with each positional winner receiving their own bobblehead likeness. In addition, various weekends will be devoted to the heritage of the Red Barons, SWB Yankees and the RailRiders eras. "When you come to see the RailRiders play," Olerud added, "you will undoubtedly see plenty of fans who support various parts of our history. That is what makes Minor League Baseball great and we truly appreciate our fans, no matter which player they loved or first team they supported. We are certainly pleased to include all of that lineage into our anniversary logo as well." The 2019 schedule features 18 games against Lehigh Valley in the IronRail series, half of which will be played at PNC Field. Scranton/Wilkes-Barre will host Syracuse for three series next year as the Chiefs become a New York Mets affiliate. The Pawtucket Red Sox, Boston's Triple-A affiliate, will play two series in Moosic next season. The RailRiders will be on the road for Memorial Day but will play at home on July 4 against Rochester and on Labor Day against Buffalo to close the regular season. The schedule will bring all 13 International League clubs to Moosic spanning 70 home games. The RailRiders will also travel to each city at least once. Scranton/Wilkes-Barre will play 12 home games in April, 15 in May, 13 in June, 13 in July and 15 in August before closing the regular season campaign with two September games at home. Dates and opponents remain subject to change. Game times and full promotional details will be announced at a later date. For more information or to purchase 2019 season tickets, please call (570) 969-2255.